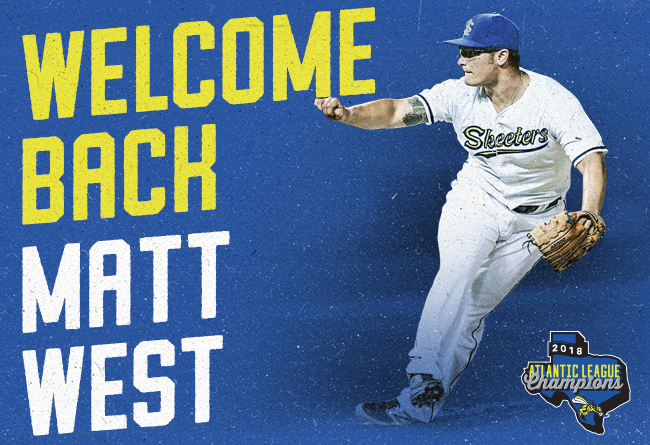 (Sugar Land, Texas, March 15, 2019) - The Skeeters today announced that they’ve re-signed former Major Leaguer Matt West. West, 30, joined the Skeeters in May 2018 and was 0-0 with a 0.54 ERA in 17 relief appearances, striking out 19 batters to two walks in 16 ⅔ innings. West threw 13 straight scoreless innings to open his Skeeters career, which was the longest scoreless streak by a Skeeters reliever last season. His 9.50 strikeout-to-walk ratio was third-best of Skeeters pitchers with at least 15 innings pitched last season. The Houston native was selected by the Texas Rangers in the second round of the 2007 MLB Draft out of Bellaire High School (Bellaire, Texas). He made his Major League debut with the Rangers in 2014 and appeared with the Los Angeles Dodgers in 2015. West is 0-0 with a 3.86 ERA through five games (7 IP) in his MLB career. West last appeared at the affiliated level in 2016 with Triple-A Oklahoma City (LAD). Along with the Dodgers and Rangers, West also appeared at the affiliated level with the Toronto Blue Jays in 2015 with Double-A New Hampshire. Prior to joining the Skeeters in 2018, his last professional appearance came with the Orix Buffaloes of Nippon Professional Baseball in 2017. Through eight seasons at the professional level, West is 12-11 with a 3.45 ERA and 20 saves in in 192 games (three starts), averaging 9.0 strikeouts-per-nine-innings.